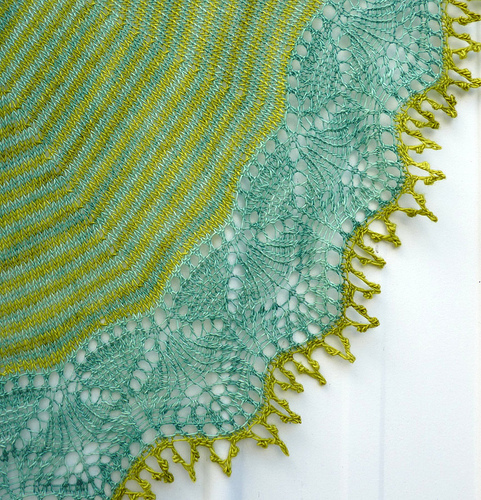 This shawl/scarf is Cladonia by Kristen Kapur from Through the Loops Designs. You can find the Ravelry details here. Again, this looks so much more complicated than what it actually is and I can recommend this project for a beginner lace knitter. Careful reading of the pattern is required as well as ensuring you don't lose any of the stitch-markers ~ ask me how I know! 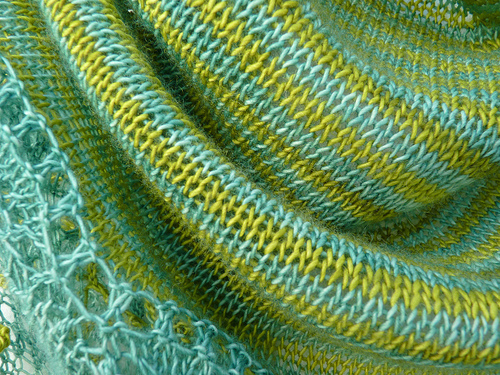 The yarn is Madelinetosh Merino Light in the colorway Clover (top) and Grasshopper (bottom). When it comes to choosing yarn I am still very much at a stage of using the same or similar colors that I have come across in projects featured on Ravelry, and then the challenge becomes sourcing those colors. I am much braver when it comes to choosing fabric/colors! A word about blocking: I wet block my knitting projects (soak finished knitting project in a small bucket with warm water for an hour or so - gently squeeze out water - wrap in towel and squeeze a little more - and then pin it to the carpet in a warm part of the house). I use blocking wires which makes this process a little easier. Blocking totally TRANSFORMS my uneven stitches and yarn over holes to what looks like a perfect and even knit. Knitting is what I do in my "spare time", like when I need a break from trimming hundreds of Half Square Triangles, and I take it with me when I head out and about. What I really need now is more hours in the day. Its beautiful. One year I had knitting as my 'spare' craft while quilting. End of last year which ended in May 2011, tatting was the craft. It does pay to have a break. My god, you KNIT too! This is beautiful! And thanks for the tips about 'blocking'. I want to block my next hand knit- just need to get it started!!! 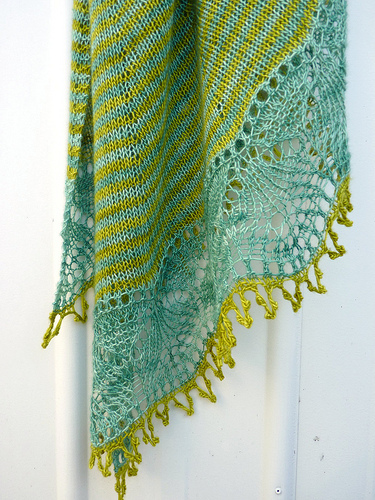 Bright and beautiful--what a wonderful shawl to add warmth to winter's grey days! It looks light enough to pop over a tank top on a cool summer evening too. wow Rita - it's beautiful! Those colors are amazing and the design is beautiful! What a fabulous shawl and what even knitting. I love the colour choices you have made and the lace is deligtful. Is this one for you? Stunning! I am getting back into knitting after many years of not doing any. Lace is something I would like to try, yours is fabulous. I will look this pattern up on Ravelry. Thanks for sharing. Have a nice cuddle in your new shawl. Stunning Rita...Love your Colour Choice.. So beautiful Rit! I hope to see many more knitting projects from you! This is beautiful, great colour combo! just gorgeous! I love the colours that you've put together, not usually two I would have picked! Your knitting is incredibly beautiful. I'm in awe of this garment. My heart shouts, "I WANT THIS", but my brain knows I cannot tackle it. Enjoy wearing this, it's amazingly gorgeous!!! You are so talented Rita - this is just gorgeous! That is so lovely! I'll have to look into making myself a shawl...I practically just wear a blanket all day in the winter I'm so chilled all the time and our house is always cold. Wonderful job! 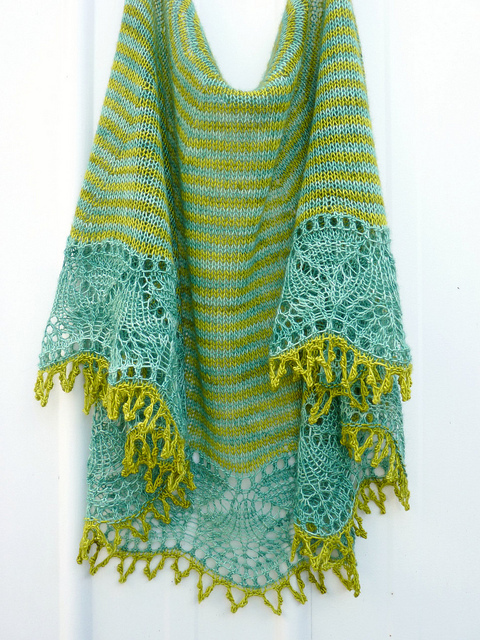 I've been wanting to make that shawl for a while now, just so many others to knit. 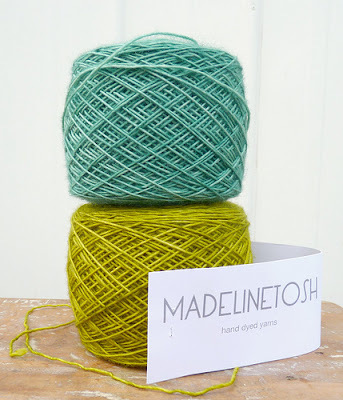 I love Madelaine Tosh yarn. I'm lucky enough to work at a wonderful knit shop in Portland, OR (Happy Knits) and we carry all the lines, so I get to try it all! Your shawl is beautiful and love the colors! It's beautiful! You chose such pretty colors! So beautiful! Love madelinetosh yarn and your color combo is so fun. I have a slight fear of knitting lace so I have added this pattern to my queue in hopes of jumping in sometime, like after I knit the other bajillion projects on my list! This is just beautiful! I love it! Wish I had that kind of talent....I knit a simple sweater once.....it took me two years! I don't knit, but this is enough to make me want to! That is absolutely gorgeous!!!! Gorgeous! Very pretty! Thank you for sharing. Have a super great sewing, stitching, and knitting day. This is crazy beautiful!!! You make me want to knit again! I love the colors of the yarn. You are quite the knitter as well as a beautiful quilter too. So beautiful! I love the colors, too. Off to Ravelry to check for the pattern. Happy to see that there's another quilter who also likes to knit. As a matter of fact, my blog started out as a knitting blog, and is now morphing towards quilting. Wow, wow, wow, wow. Yes, we really need more hours in our day. I knew you are a bit of a quilting genius but had no idea you could do magic with your knitting needles as well. Just gorgeous! Is there no end to your talent? Wow, this is so beautiful. I cannot believe it would be considered a beginner project; that lace is stunning. You are SO damn talented :)! The shawl blew me away - beautiful colors, workmanship and just WOW. Great job. This really is so beautiful... do you want to make me one for Christmas? Absolutely gorgeous! You are very talented - well done! Lovely! I really love the edging on that shawl. wouw I love it !!!!!!! Great colours and a very nice pattern beautiful !!!! Gorgeous! I get the yarn bug in the summer. I know...weird. Very impressed by your knitting prowess! I used to do a lot of knitting but never had the courage to do lacy knitting, very nice. Wow! That lace work is gorgeous. Beautiful shawl! I love the colors and pattern! Wow from me too. I can't believe how many quilters are also knitters. I just learned to knit in the past few month....I have the bug as well. Beautiful. Thank you for sharing.